Brad Reh has been in the jewelry business for over 25 years. He is the third generation in his family to have a professional career in this field. He is the president of Brad Reh, Inc. which exhibits at high end antique and design shows throughout the country. 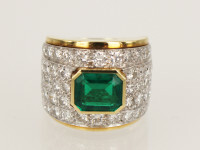 Brad has an extensive inventory of fabulous estate and signed jewelry representing the major jewelry houses of the world. These include but are not limited to: Van Cleef & Arpels, Cartier, Boucheron, Tiffany, Bulgari and many others. Earrings by Tiffany & Co.